For more than a decade, feet have been washing up on BC coasts, leaving many wondering where the hell they’re coming from. The shoe the foot was found floating in. Photo via BC Coroner's Office. 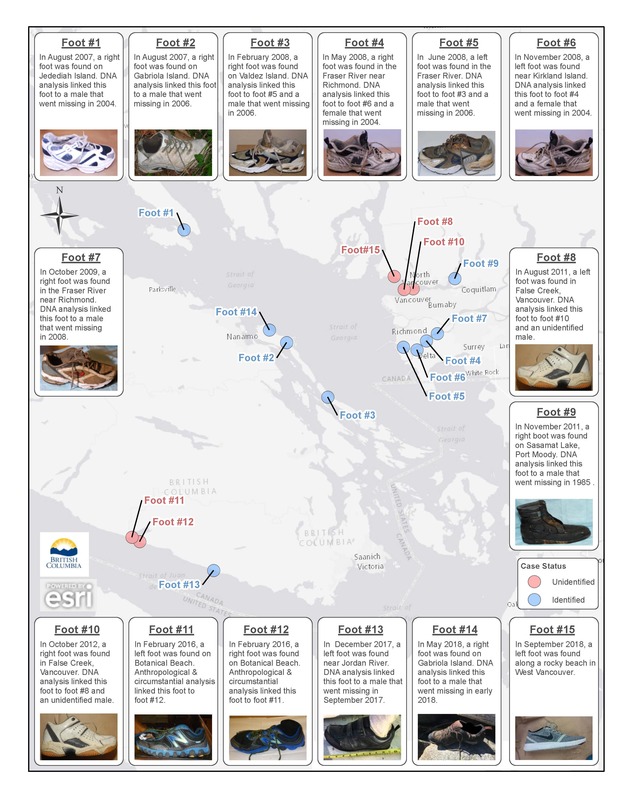 In September of last year, a foot tucked tightly into a running shoe and emancipated from its body bobbed its way to a BC coastline and washed ashore—and now the coroner wants help identifying its owner. This foot, in the grey Nike seen above, marks the 15th time since 2007 this has happened—a rate of more than one washed up foot per year. Sometimes they have the tibia and fibula still connected, sticking out like a incredibly macabre periscope. Sometimes they’re found with only the ankle downwards. In all cases, the feet are found in a shoe. Every time this happens, Canadians are asking themselves, what the hell is going on over in BC? It’s weird, it’s eerie, and it smacks of mystery—something you might hear from your stoner friend at a bar, concluding with a breathy, “I dunno, man, what do you think!?!? !” It’s an almost perfect puzzle—equal parts grisly and weird. You can just imagine yourself discovering one—walking down the beach, seeing a shoe, and not quite fully knowing what you’ve found until you gaze down into the waterlogged remains of what was once a human foot. The first bobbing foot of 2018 appeared on a beach in West Vancouver last September. Police say that they weren’t able to match the DNA to a missing person but were able to determine it was that of a male under the age of 50. The foot was found floating in a “light grey Nike Free RN shoe with a black Nike swoosh logo and white base, white laces and a blue sock.” This time they're asking the public for help in figuring out who it came from. Some have posited the conclusion that many of us would all jump to: an incredibly niche serial killer with a thing for cutting off the feet of his victims and throwing them into the ocean is at large. Or maybe various Lower Mainland gangs are covering their tracks by anchoring their hits at the bottom of the Burrard Inlet, only to have one shoe-protected foot escape. If you pop onto YouTube, or wherever it is you get your conspiracies, you can find countless videos attempting to explain this strange phenomenon. To put it bluntly, the feet separate because the ankle is a weak part of the body. Over time the sinew in the feet—degraded from the work of the decomposition, salt water, and the current—would separate from the leg and the foot would float off from the body upward. No one is sawing off these feet. The feet have appeared all over coast, but seem to gather predominantly in the Strait of Georgia area. All but three were found on the strait—the others were found in the Juan De Fuca Strait on the westside of Vancouver Island. The feet are typically found in connection with people who have gone missing in recent years. For example, a foot found in May of 2018 was connected to a man who went missing earlier that year, and a foot found in 2007 was connected to a man who went missing in 2006. Where the feet have been found. Photo by the government of BC. Full photo can be found here. That’s not always the case, though. In 2009 a boot was found that was eventually connected to a man who went missing back in 1985. Excluding this newly-discovered foot, the four remaining feet come from only two bodies. It was discovered they were both pairs—one discovered in 2011 and the other in 2016. It’s not just a mystery confined to BC either, if you include the entire Pacific Northwest into the discussion, the number jumps from 15 to 20. The most recent was found on New Year’s Day 2019 on a man-made island outside of Everett, Washington—they’ve since matched the foot to a man missing since 2016. Depending on wind and current conditions, body parts routinely wash up in other spots around the world as well, including places in South America and in tropical locations like Fiji. So, like in most cases, it’s shoe scientists who can be blamed for this phenomenon, not a demented serial killer.